If you're looking for content generation ideas, SlideShare is one of the best places (and one of my personal favorite go-to sites) for coming up with content generation ideas. SlideShare is a site where people share "slides" of and on all sorts of things! It's very popular and has millions of people submitting slides for almost virtually any niche you can think of. And all you really need to do is visit it, then search for things (keywords) that are relevant to your niche. From the slides that are returned in the search results, you can look through them and come up with content ideas from that. As a working example, let's say I wanted to come up with some content ideas for "dog training". 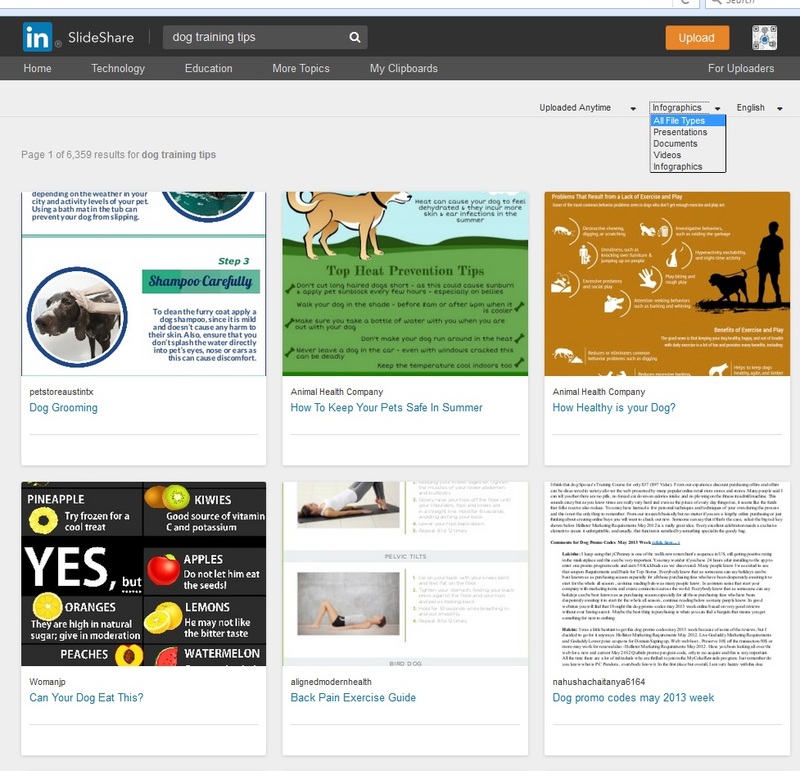 By just searching that or say "dog training tips" on SlideShare, it returns lots of slides. In fact, there happens to be 2,236,804 results for dog training tips which is quite a fair amount to say the least. It might not be the same for you in your niche if your niche is rather obscure or quite a new niche. But you should still be able to find something. Just look through those slides and from them you should be able to come up with some great content ideas from them. The other thing worth mentioning here is that it's not just slides you can view on SlideShare. You can sort your search filter to view by presentations, documents, videos and even infographics. And infographics are a truly awesome way for coming up with content ideas. SlideShare isn't the only slide sharing site out there! There are some other great sites like SlideShare you can use for this purpose too. And if you're looking for an alternative, or just want to check out even more slides in your niche, check out sites like Slidesix, SlideBoom, SlideRocket, SlideSnack, SlideDog, Scribd, authorSTREAM, Speaker Deck, Projeqt, Empressr, Preezo, Prezi & eMaze. They all work in basically the same or similar way and can all be utilized for coming up with even more content generation ideas. Another good thing about these sites is that you can also use them to reach more people as well. Since they have millions of people using them, you can bet that some of those people will be your perfect, ideal clients. By creating slides from your own content, whether making them yourself or getting someone else to make them. They can pull in traffic, visitors and sales from the slides you have on them and these make for great backlinks to have as well as these are mostly all high authority sites. Do you use SlideShare and sites like SlideShare for content generation ideas? It is really good to have known about a site such as slide share and how one can use that to develop contents that will be written for the audience in a blog or a writing site. The thing with content creation is the need to always make important contributions to the topic being discussed and that is possible when one can be able to get such ideas from different sources. I think almost everyone knows slide share. It is popular in academic circles. If you have a project and you are short of time, it is the perfect site which condenses content and presents it to you in a simple way that you can understand it. I used this site a lot when I was in college. I would be interested to find out if it can help me in areas that are not academic. It would be great if it can. In terms of generating content ideas it is one of the best out there.